Rachelle Olsen, Gold Comb founder, elevates the salon experience creating glistening, sun kissed looks! Beginning as an apprentice with Tony and Guy, Rachelle has over sixteen years of experience, mastering her craft. Her dynamic style was defined early on, specializing in sun kissed, luminous, healthy, glowing hair. By utilizing the latest techniques to create dimension rich style to women’s most prized possession, their hair. Rachelle’s affable personality allows her to work closely with each client to find a style that is not only flattering, fashion-forward and fun but suits each individual. With an eye to see what color compliments each and every head of hair where each highlight should be placed and where every lock of hair shall bounce as you walk out with radiant hair. Blonde, brunette, red headed babes alike flock to Gold Comb for the fiercest looks around. Take the time to make your best accessory shine at Gold Comb! Born in Bellingham and raised in the pacific northwest, Ashley comes to Gold Comb with a passion for painted color, lived in razor cuts and a thirst for continuing education. Having graduated from Toni & Guy in 2013, she has also studied in New York at Bumble & Bumble, as well as attending as many local classes she can get her hands on. Keeping up with current trends and techniques, she pushes herself to work with her clients lifestyle and has a passion for helping her clients recreate looks can they can achieve outside the salon. With a well rounded clientele of women and men, Ashley appreciates what each head of hair brings to her skill and technique. When she's not over a head over hair, Ashley can be found cracking jokes with friends over a glass of rosé , dreaming of her next adventure and/or cooking with family and friends. With over 13 years of experience, Carma has a passion for staying on top of the constant changing hair trends and techniques. Having well rounded training and knowledge in all types of cuts and color, she helps her clients achieve their best ultimate look highlighting their best features. With a kind, fun, and caring personality, Carma helps her clients feel comfortable in her chair, and helps them walk out the door feeling confident and beautiful. Carma has had professional training at the Bumble and Bumble University in NYC along with attending classes taught by other professionals in the business keeping her inspired and helping her perfect her practice. On the days when she isn’t loving life behind the chair, she is loving life with her most prized possession, her son Logan. Each day is filled with new inspirations from outdoor adventures, to traveling, or just being around friends and family full of love and laughter. Graduating from Gene Juarez in 2004, Amy immediately threw herself into the busy salon life to build her network and learn as many techniques as possible. Since 2005, She's been mastering her craft in beautiful Bellingham, WA. Viewing education as an essential part of her career, she has visited the House of Bumble and Bumble in NYC numerous times, completing Scissor and Razor cutting, Hair-color, Styling and Network Education workshops. 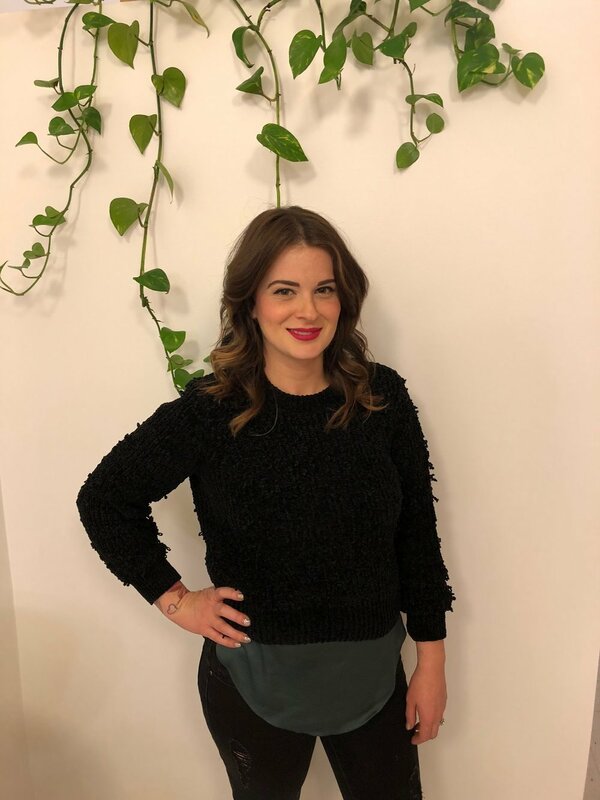 Amy loves hair painting and a great power bob, but most of all, she cherishes creating long lasting relationships with her clients and making honest, realistic looks that can easily be recreated at home. When she is away from the Salon, Amy loves snuggling her 2 Long Haired Wiener dogs, traveling, and trying new culinary experiences with her husband. Lucy the pint sized blonde vixen, has been enthusiastically managing gold comb salon since its inception. Not only does she take on the duties of receptionist, cuddle buddy, and cut consultant (color escapes her) she also mans security. Lucy wants to make sure you have the best experience ever at gold comb please reach out to lucy@goldcomb.com. Please be patient with response times, typing is not her forte. However she loves to Paw-Ty!